Bay Development Group's apartment tower would replace a surface parking lot at the corner of 14th Street and Alice Street. 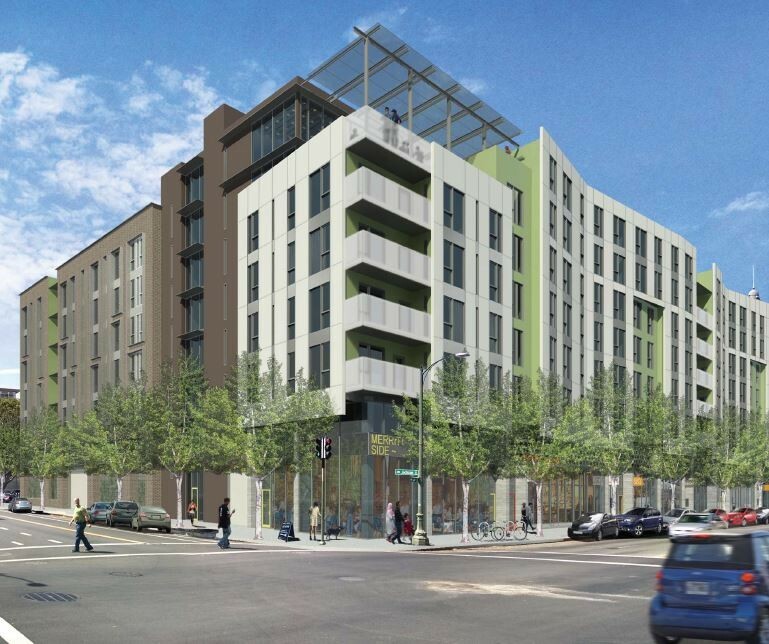 Developers unveiled plans last night to build two big apartment buildings along 14th Street in downtown Oakland. The buildings would add 384 new apartments at the intersection of 14th and Alice streets. Both projects would replace existing surface parking lots with housing, restaurants, and shops. The neighborhood’s residents met the plans with a mixture of support and concern. Many residents commented on the absence of any affordable housing in both projects. Some residents are also worried about the possible impact of simultaneous construction of two very large buildings on their businesses. Others voiced concern about whether or not residents of the new buildings would be good neighbors to the Malonga Casquelourd Center for the Arts, an arts institution that has recently received noise complaints. One of the projects, proposed by the Bay Development Group, a San Francisco-based company, would raise a 17-story tower at the corner of 14th Street and Alice Street on land this is currently used as surface parking. The tower would include 126 apartments, most of which would be studios and one-bedroom dwellings. The project would include 81 un-bundled parking spaces in a multi-level garage. There would be no affordable housing in the building. 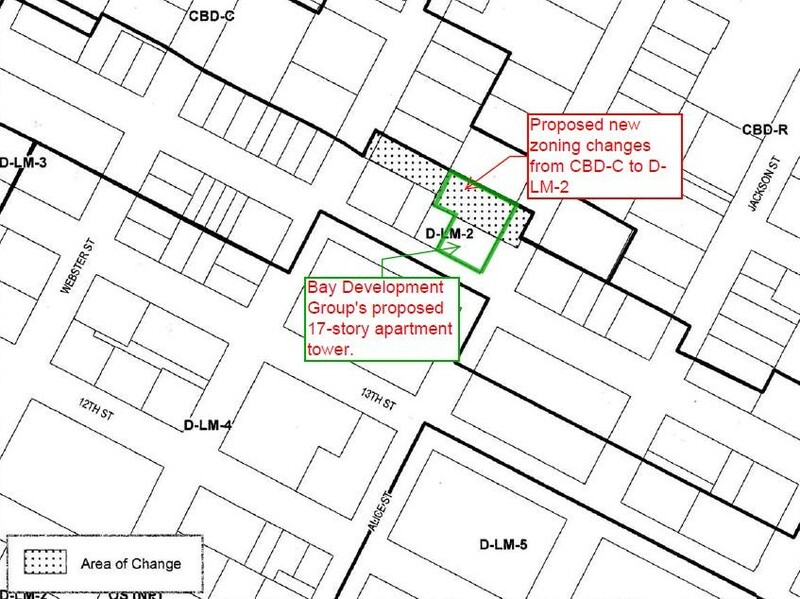 Zoning changes recently proposed by city staff overlap with Bay Development Group's apartment tower plans. Last night's meeting also confirmed that the city's planning department has been working to spot zone parts of the city to benefit specific developers. As I previously reported, in October city planning staffers attempted to change the zoning of several parcels along 25th Street in Oakland’s Uptown neighborhood as part of a purported effort to “clean up” the city’s planning code. But the proposed changes overlapped exactly with parcels recently acquired by Signature Development Group, and the changes would have greatly benefited Signature by increasing the value of the land in terms of how it could be developed. 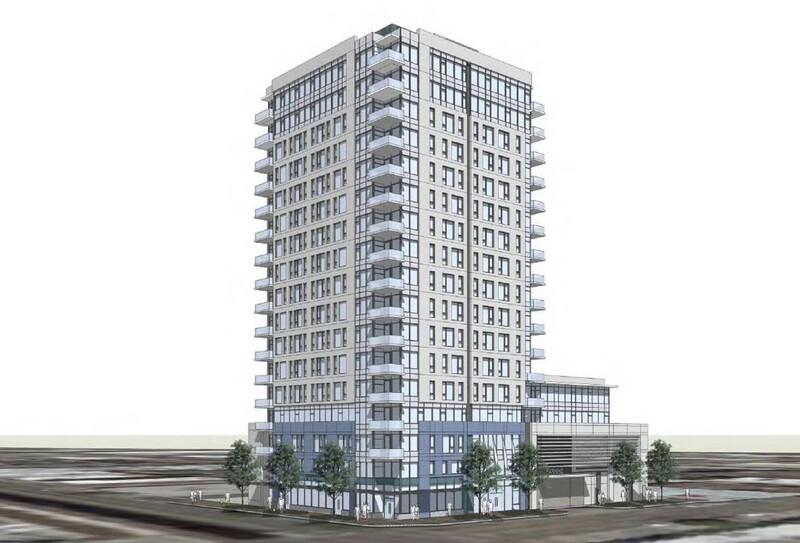 Last night’s meeting at the Hotel Oakland confirmed that similar zoning changes proposed by city staff along 14th Street overlapped with Bay Development Group’s proposed apartment tower and parking garage. City staffers pulled the proposed zoning changes the same night they were presented to the planning commission, and it’s unclear if they will be brought back at any point. According to city records, the city council will not hold hearings on impact fees until at least January. The council will not vote on impact fees until later in 2016, and based on slides presented to the city’s impact fee “stakeholder” group, it’s likely any impact fees approved will be slowly phased in over several years. Projects that obtain building permits in the next several years may not have to pay any impact fees for affordable housing, or will pay a smaller phase-in fee well below $20,000. The second project unveiled last night would put two seven-story buildings on the surface parking lot bounded by 14th, Alice, 13th, and Jackson streets. The project would add 258 new housing units and could line 14th Street with shops and restaurants. Like the proposed nearby tower, this project would also include zero affordable housing. Brian Pianca of Wood Partners, the project’s developer, pointed to existing affordable housing in the neighborhood as one reason why his company isn’t planning to build affordable units. “This is going to provide that other kind of mixed-income housing in the neighborhood,” Pianca said about market-rate housing. Most of the units in Pianca’s buildings would be studios and one-bedroom apartments. There would be approximately 226 parking spaces, about 0.75 for each apartment. Some residents at last night’s meeting said they were concerned the elimination of the parking lot would make parking more difficult. Others praised the move, and the decision by both developers to reduce parking in both their projects in order to fit more housing and retail space and rely on public transportation. Wood Partners' 258-unit apartment buildings would replace a surface parking lot on 14th across from the post office.